Isla Mujeres accommodations range from Hotels, Boutique Hotels, Vacation Rentals, All Inclusive Hotels and Packages as well as Hostels. Explore our list of options to find the right accommodation for you. Options range from downtown to the colonias, south point and Sac Bajo. Whether you’re looking for a budget or luxury boutique hotel in downtown Isla Mujeres, there are options for everyone. Casa Isleño sits on the quiet street of Av Guerrero neighboring the former hospital and directly across the street from the world famous watering hole, Pita Amore’. It’s location is just walking distance to literally “everything” in Downtown Centro. A great boutique hotel, located downtown, Isla Mujeres Mexico . A great place to stay with a central location – blocks from the beach & around the corner from downtown Isla Mujeres shopping, bars & restaurants. Our intimate six-room boutique hotel has been created from a lovingly restored, historic Spanish colonial-style residence. Located in a quiet neighborhood in the heart of a quaint island village, the best beaches, restaurants and shopping are within a 10-minute walk. Boutique Hotel in Isla Mujeres Located on the far east side of North Beach, Isla Mujeres. 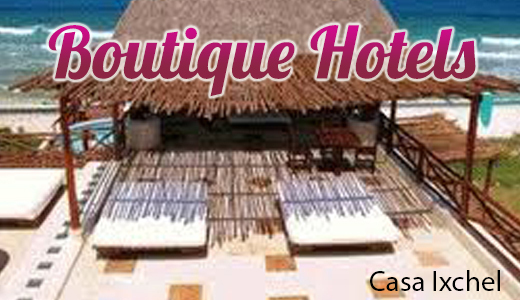 Boutique Hotel in Isla Mujeres Located downtown on your way to North Beach on the east side. Located just steps away from downtown restaurants, shopping & entertainment, the main ferry port and the powder white sands of Isla Mujeres’ North Beach. Hotel in Isla Mujeres. Located downtown on Playa Secreto. Hotel Rooms in Isla Mujeres Located downtown between Lopez Mateos and Matamoros. Nautibeach Condos are located directly on North beach with stunning of Isla’s amazing sunsets. Staying on the Caribbean side in Isla Mujeres offers stunning views with a close and convenient location near town. Boutique Hotel in Isla Mujeres, located on the far south end of the airport strip on the east side. Hotel and Suites in Isla Mujeres Located on Rueda Medina heading out of downtown on your west side. Guest rooms in Isla Mujeres. Located in the Colonia near Mango Cafe. Hotel Rooms in Isla Mujeres Located on Vicente Guerrero. Suites in Isla Mujeres Located approximately half way down the island and facing east to the open Caribbean. B&B Accomodation Isla Mujeres Rueda Medina in the Colonias. B&B in Isla Mujeres. Waterfront, located in the colonias on the Carribean side. Guesthouse in Isla Mujeres Waterfront Caribbean side in the Colonias. Hotel Rooms in Isla Mujeres Located on the airport strip on Isla Mujeres Cancun side. Beach House in Isla Mujeres Located on the Caribbean side of the Airport Strip. Guest Rooms in Isla Mujeres. Located on the Airport Strip – Cancun side. Staying at South Point offers some of the best views of Isla Mujeres, from either the Caribbean side or Cancun side. Keep in mind it is more secluded but still an easy golf cart or taxi ride into town. Furnished Apartments in Isla Mujeres Located just north of Garrafon Park. Hotel Rooms in Isla Mujeres. Located at south point next to Garrafon. Would like to book room on North end of the island. Prefer all inclusive place but would consider renting a condo.